The 8th Annual Perez PTA Fall Festival will have plenty of fun, food and games this year! And also this year we have a special treat: the Austin Police Department’s brand new helicopter may be landing here during our festival! Bring your family and friends to join in the celebration. You’ll be helping raise money for field trips, book fairs, and other experiences for our Perez Pythons! Parents, staff, and other volunteers are planning an exciting event for everyone, but we also need your help! There are many ways to volunteer. You can help by donating the items listed on the flyer that was sent home. You can also help set up or take down booths. Or, you can take a leadership role by helping run a booth. We also need people who can float from place to place to fill in as necessary. We need you, whether it’s for 1 hour or 4 — every minute you can help makes a huge difference! El Festival anual de Perez tendrá un montón de diversión, comida y juegos este año! Y también este año tenemos un regalo especial: un helicóptero nuevo del Departamento de policía de Austin puede aterrizar aquí durante el festival. Trae a tu familia y amigos a unirse a la celebración. Usted puede ayudar a recaudar fondos para viajes de campo, ferias de libros y otras experiencias para nuestros pitones de Perez! Los padres, el personal y voluntarios están planeando un evento emocionante para todos, pero también necesitamos su ayuda! Hay muchas maneras de ser voluntario. Usted puede ayudar donando los elementos que aparecen en el folleto que fue enviado a casa. También puede usted configurar o derribar las cabinas. O, usted puede tomar un rol de liderazgo por ayudar a un stand. También necesitamos gente que pueda flotar de un lugar a otro para rellenar según sea necesario. Te necesitamos, si es por 1 hora o 4 — cada minuto puede usted hace una gran diferencia! 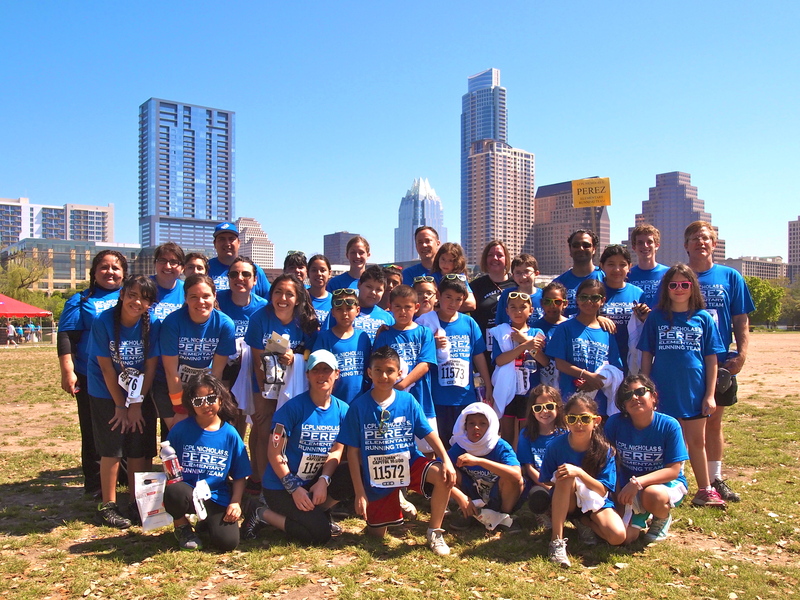 As a part of our school-wide effort to help students become healthier, happier and smarter, the LCpl Nicholas S. Perez Elementary School Running Team participated in the Statesman Capitol 10,000 Run this past weekend. At least 43 students, staff members and family members walked or ran the ten-kilometer (6.2-mile) course! The runners prepared with early morning practices three times per week. There motto was “Run like a Python!” This was one of the 10 or more family field trips that the school takes each year to expose students and their families to opportunities outside of the neighborhood, including Explore UT, the MLK March, Introduce a Girl to Engineering Day, the Austin Powwow, the Texas Book Festival and more. A huge thank you goes out to our VIPs, Volunteers Improving Perez. As of January 31, 2012 the following VIP members have reported over 50 hours of their time this school year helping to make our school stronger! Thanks! Can we get at least 3 hours of help from every family? Volunteering benefits your children and helps make our school the best it can be. Thank you to all of the family members who have helped our school by volunteering your time. If every family contributed just three hours per year, we would get over 180 days worth of assistance – the equivalent of a full‐time employee. Have you already volunteered at least three hours this year? If so, thank you! If not, please consider ways that you can help in the classroom, in the office, in the library, in the cafeteria, or even at home. Call the school for more information on how you can help or sign up online. Be sure that you sign in when you volunteer, as we will soon be sending a special thank you to all of our volunteers. Special thanks to all of our families who have volunteered more than 3 hours! In case you missed them, here are our major flyers for the month of March, 2012. In case you missed them, here are our major flyers for the month of February, 2012. 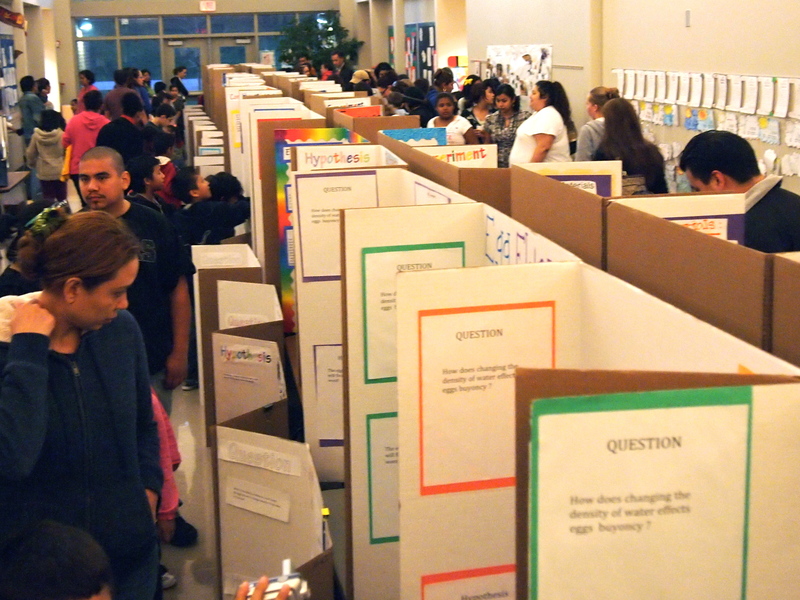 Our first full-scale science fair on January 26th was a huge success! Students and parents browsed their own and other projects, viewed the stars through our incredible new telescopes, went on night hikes on the trail, enjoyed a hot dog dinner, and watched part of Planet Earth. 235 students signed in. With parents, staff, and students combined, there were over 450 people here. Thanks to everyone who made it a big success, including the teachers who guided their students in creating projects, the science team for their help planning the event, the teachers who attended, the PTA and other parents for helping with food and more, andthe Partners in Education who sponsored it.